Why take a tent? 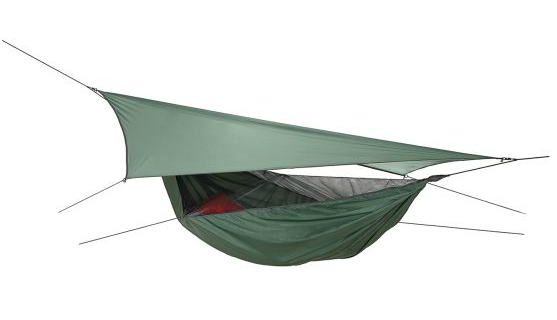 Just string up the easy-sleep hammock with built in mosquito net and waterproof cover sheet. Traditional hammocks only support the upper spine, so a night in one can be a pain in the back. Not in the Hennessy; it’s asymmetrical: sleep diagonally across the centre line and lie virtually flat out. With a bit of experimental wriggling you can find other comfort spots on your side or even in a foetal position. The a-sym shape also makes it far more stable than a normal hammock so you won’t feel like you will tip out at the slightest shift of weight. It is not only comfortable, it’s a cocoon with a sewn-in mosquito net – climb inside for an insect bight free night. The entrance is through a slit in the bottom that runs from one end to the centre. Step inside, spin round sit down and then lie flat. Your weight reseals the velcro and closes it up tight. Inside, there’s a rope running along the inside of the ridge-line for attaching light items like clothes, a torch or a towel. A separate rain-proof sheet, shaped to give the hammock maximum protection can be strung up over it. This can also be used as a sun shade. If there’s no anchors strong enough to support your weight and all you can find are saplings the Hennessy can still be very useful. Tie it up so that the fly sheet is taught and the hammock on the ground and it makes a simple one man tent. Setting it up for the first time can be a little difficult; tying the knots, finding well spaced trees, stringing up the rain sheet so it will keep the worst of the water off, but use it a couple of times and it’s quicker and easier than pitching most tents. One of the best night’s sleep you can have outdoors. An innovative alternative to lugging around a tent.